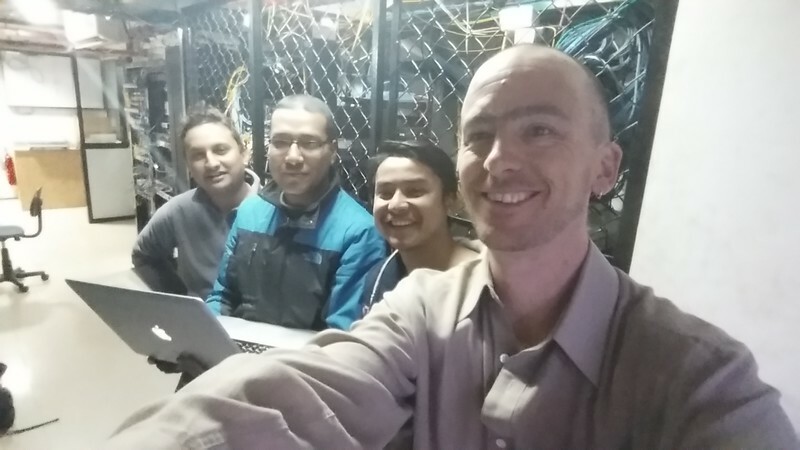 I was lucky enough that my work sent me to both visit our office and team of 4 in Nepal, and as well to attend SANOG 27. After submitting my talk on TLS using Let’s Encrypt, I was humbled to have been selected to present as well. 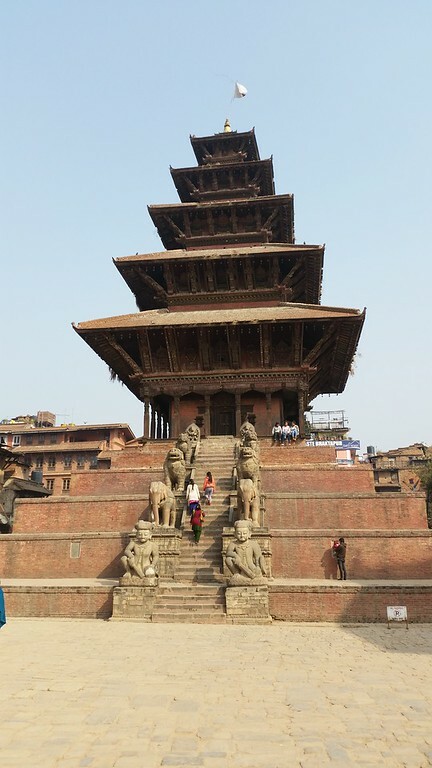 This is my first trip to Nepal and the place is amazing. I’m sad to report that on top of the thousands killed and way more displaced, amazing, ancient sites were heavily damaged in the 2015 earthquake. 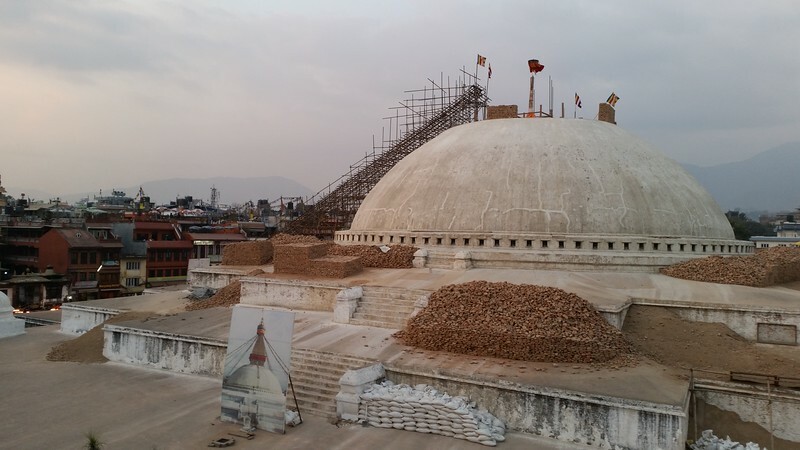 I visited both Kathmandu Durbar Square and Boudhanath both of which suffered devastating damage. Thanks to my awesome co-workers, they took me on a motorbike trip to Nagarkot which gave me a chance to get away from the hotel and see something more than nearby Thamel. Kathmandu Valley countryside is beautiful. Though the smog prevented epic views of the Himalayas, staying at the mount side hotel and waking early to see the sunrise was splendid. 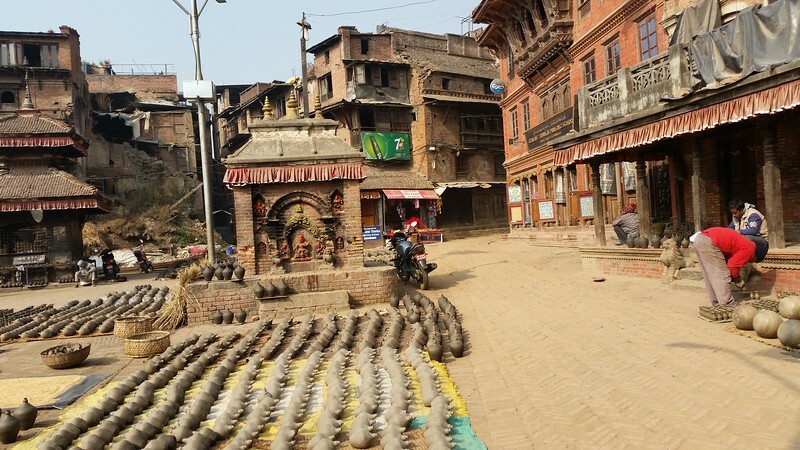 On our return ride to Kathmandu, we stopped at Bhaktapur Durbar Square, which suffered much less damage from the quake. The Nyatapola Temple is stunning. This is my first time attending a Network Operators Group (aka “NOG”) meeting. The bar for future NOGs has been set very high given how amazing SANOG 27 was. The conference, though attaining an all time high over 300 attendees, felt quite small. Given that I was a speaker and staying at the hotel where the conference was, I was also treated almost every night with a dinner paid for by a local sponsor (or not so local in Huawei’s case). There were a couple very sales-centric talks (which is frowned upon), otherwise most of the talks were impressive and informative. I attended them all as there was only one track with all attendees present. You can see my slides or you can re-watch the live streamed YouTube recording. I was humbled to receive many compliments on my talk, but I feel I have room for improvement! 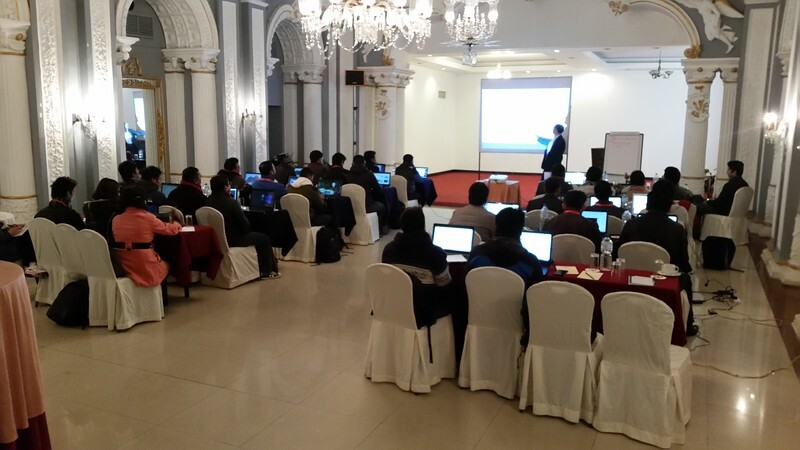 Special thanks to Fakrul Alam for letting me do a brief Let’s Encrypt demonstration during the Network Security workshop (and also for doing a quick key signing!). Anyone looking to up their game should seriously consider attending a regional NOG. For example, SANOG 27 was $310 all in: Conference, Tutorial and Workshops with Lunch for all 8 days. Considering flights from the US are well under $1,000, this is quite cheap compared to, say, Black Hat. At over $2,000 for Black Hat, if you took this money to SANOG 27 instead, you would be able to pay for airfare, the full Monty of conference, workshops and tutorials, your hotel AND get a trip to Kathmandu included! I can not underscore enough the level of expertise I saw in the presenters and teachers here. They’re simply amazing. 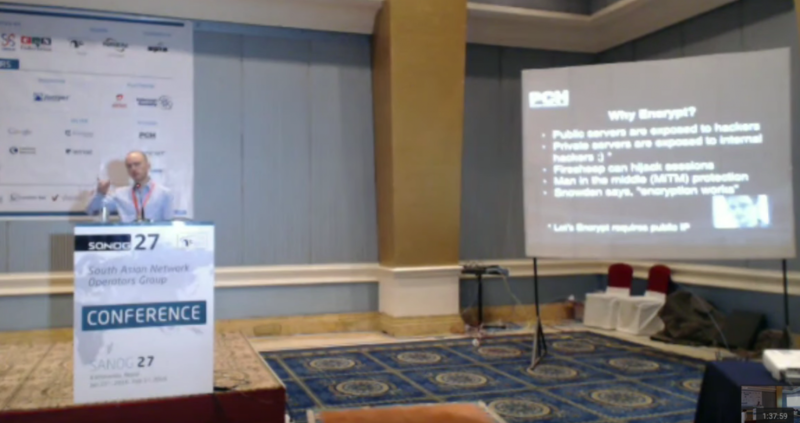 Dileep Agrawal’s (World Link Communications) talk on Jugaad AKA a history of ISPs in Kathmandu. Philip Smith’s (NSRC) talk on the State of the Internet Routing Table – 500+k BGP entries and growing!! 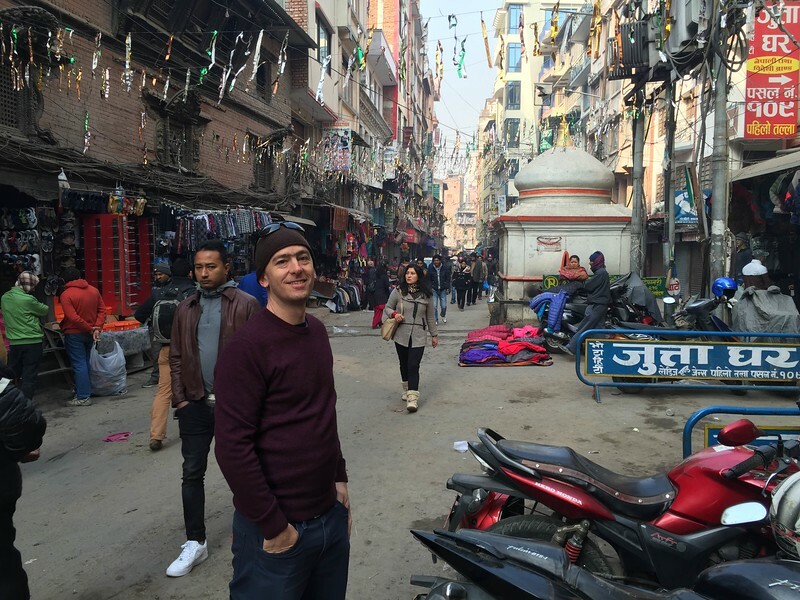 Meandering around from the Hotel to Khatmandu Durbar Square with Donald Clark (Google). Thanks to PCH for sending me! Thanks very much to SANOG 27, Aftab Siddiqui, Gaurab Raj Upadhaya and GZ Kabir for accepting my proposal to speak! Most of all my thanks to the totally awesome PCH staff who live in the Kathmandu valley. Thank you thank you thank you to Kabindra Shrestha, Chatur Ratna Shakya, Rustan Shrestha, and Dibya Khatiwada. They extended an amazing amount of hospitality and made me feel very welcome at both SANOG and their homeland at large. The best gift a foreigner could ask for is the welcome and help that I received from these four. You are all amazing!